Solid tumors contain many different cell types from various lineages. In many tumor entities, tumor cells within a solid tumor are often outnumbered by the stromal cells. A prominent example is pancreatic cancer where tumor cells frequently amount to less than 10% of all cells within the lesion. Unfortunately, no generally applicable specific tumor cell marker is available. Markers such as EpCAM or E-cadherin, which are commonly used for the characterization of human tumors, are not tumor specific in mice. Therefore, tumor cell–specific markers need to be identified empirically for each mouse model. The most complex lineage of non-malignant cells infiltrating the tumor are immune cells, i.e., tumor-infiltrating lymphocytes/leukocytes (TILs). Basically, all immune subpopulations can infiltrate a tumor, regardless of whether they exert tumor-suppressive or tumor-promoting functions. While cells such as cytotoxic T cells, T helper cells, and M1 macrophages are tumor-suppressive, regulatory T cells or M2 macrophages usually promote tumor growth (PMID: 24122236). The frequency of TILs is highly variable and ranges mostly between 2% and 50%. The overall TIL population can be easily detected by their ubiquitous and specific expression of CD45. In addition, dozens of TIL subpopulations can be defined by the expression of surface marker combinations. Cancer-associated fibroblasts play a key role in the modulation of a tumor’s extracellular matrix and can be present in high frequencies inside the tumor and the tissue surrounding the tumor. The effect of transforming tissue into dense fibrotic structures is called desmoplasia and represents a common phenomenon in many carcinomas, including breast or pancreatic cancer (PMID 14581350). Besides shaping tissue architecture, fibroblasts also can play an active role in tumor growth promotion and metastasis by secretion of cytokines and pro-tumorigenic extracellular matrix molecules, for example (PMID: 19308067). Fibroblasts can cover more than 50% of the tumor area in tissue sections due to their large size and deposition of extracellular matrix filling a significant part of the tumor space. Their actual frequency however is quite low. Fibroblasts express markers such as CD44, CD90.1 or CD90.2 (depending on the mouse strain), and vimentin. As these markers are also expressed by other lineages within the tumor, marker combinations are required for unambiguous fibroblast identification. To assure oxygen and nutrient supply, tumors induce vascularization by endothelial cells and pericytes. However, the frequency of these cell types usually is below 4%. Endothelial cells can be detected using the markers CD31 and CD146. Specific detection also requires marker combinations such as CD45–CD31+. In general, the frequency of fibroblasts and endothelial cells is lower in mouse tumor models compared to the corresponding human tumors due to the faster tumor growth kinetics in mice. Miltenyi Biotec has developed dedicated applications to isolate and characterize different cell types from tumor tissue. Efficient dissociation of tumor tissue into suspensions of viable single cells is a prerequisite for many downstream applications, such as isolation of tumor cell subpopulations, cell culture, or flow cytometry. For details on sample preparation, see chapter Mouse cells and organs – Tumor tissue. Miltenyi Biotec has developed numerous products for the magnetic separation of the various cell types that can be found in tumor tissue. For details on MACS® Cell Separation Technology, see the MACS Handbook chapter Magnetic Cell Separation . Solid tumors are infiltrated by cells of non-tumor origin, including heterogeneous lymphocyte subpopulations, fibroblasts, and endothelial cells. The amount and composition of infiltrating cells is highly variable, which makes the analysis of primary tumor samples difficult. In addition, the culture of mouse tumor cells is frequently hampered by fibroblasts overgrowing the target cells, which can bias assays such as drug sensitivity tests. To overcome these limitations, Miltenyi Biotec has developed the Tumor Cell Isolation Kit, mouse, which provides a fast and easy method to isolate untouched mouse tumor cells from dissociated primary tissue. This cell isolation procedure is based on the comprehensive depletion of cells of non-tumor origin such as TILs, fibroblasts, and endothelial cells based on MACS® Technology. The underlying negative selection strategy enables the isolation of tumor cell populations without knowledge of surface protein expression on these cells. Even from tissues that initially contain only low numbers of tumor cells (<20%), purities of greater than 95% can be achieved in less than 20 minutes. Enriched tumor cells remain untouched, improving any downstream analysis. Isolation of mouse breast carcinoma cells. Tumor cells were purified from a dissociated mouse 4T1 tumor using the Tumor Cell Isolation Kit, mouse, an LS Column, and a QuadroMACS™ Separator. The 4T1 tumor cells were GFP-labeled prior to tumor induction. The unseparated fraction and the negative fraction were analyzed for GFP and lineage markers by flow cytometry using the MACSQuant® Analyzer. Isolation of mouse colon carcinoma cells. GFP-expressing CT26.WT were isolated from a heterogeneous cell population using the Tumor Cell Isolation Kit, mouse. Subsequently, the unseparated fraction (A) and the mouse tumor cell fraction (B) were cultured for three days and stained with a CD90.2 antibody (red). Cell nuclei were stained with DAPI (blue). Tumor cells were detected by their GFP expression (green). CD326 (EpCAM) MicroBeads, mouse allow for the positive selection or depletion of epithelial cells or epithelial tumor cells from single-cell suspensions of tissues expressing the mouse CD326 (EpCAM) antigen. For the enrichment of epithelial cells based on CD326 (EpCAM) MicroBeads, prior depletion of CD45+ cells with CD45 MicroBeads is recommended. Isolation of tumor cells from tumors induced by the 4T1 cell line. Tumors were dissociated using the Tumor Dissociation Kit, mouse and the gentleMACS Octo Dissociator. CD45+ cells were depleted using CD45 MicroBeads, a MidiMACS™ Separator, and an LS Column. CD326 (EpCAM)+ cells were isolated using CD326 (EpCAM) MicroBeads, a MidiMACS Separator, and an LS Column. The cells were fluorescently stained with CD45-PE and CD326 (EpCAM)-APC and analyzed by flow cytometry using the MACSQuant Analyzer. Cell debris and dead cells were excluded from the analysis based on scatter signals and propidium iodide fluorescence. If the samples to be analyzed come from xenograft models, Miltenyi Biotec offers effective methods to separate cells of mouse and human origin. For details, see chapter Isolation of tumor cells from xenograft models, tumor cells, human. Immunotherapy against cancer has proven clinical efficacy and tremendous potential in multiple tumor entities. Syngeneic mouse tumor models represent excellent systems to analyze effects of immunotherapy as they possess a fully competent immune repertoire. However, the amount and composition of tumor-infiltrating leukocytes (TILs) is highly variable, complicating the targeted analysis of subpopulations. In particular, small subpopulations might escape analysis as they might be lost in the background noise. Immunophenotyping of TILs by flow cytometry is time consuming and data processing highly work intensive. Therefore, efficient pre-enrichment of TILs is desirable to increase sensitivity of analysis and save time and effort during flow cytometry. Miltenyi Biotec has established an automated workflow combining gentle tissue dissociation with specific isolation of TILs. The process preserves cell surface epitopes and thus overcomes bias in immunophenotyping, which is a frequent issue with other tissue dissociation procedures that rely on aggressive or impure enzymes. A list of preserved epitopes can be downloaded from the Related Resources panel to the right. CD45 (TIL) MicroBeads, mouse enable the positive selection of the overall CD45+ TIL population from suspensions derived from solid mouse tumors, e.g., CT26.WT, 4T1, and B16F10. Isolation of TILs from tumors induced by the B16F10 cell line. A tumor induced by the B16F10 cell line was dissociated using the gentleMACS™ Octo Dissociator with Heaters in combination with the Tumor Dissociation Kit, mouse. CD45+ TILs were isolated from the resulting single-cell suspension using CD45 (TIL) MicroBeads, mouse, an MS Column, and a MiniMACS™ Separator. Cells were fluorescently stained with CD45-PE and Labeling Check Reagent-VioBlue® and analyzed by flow cytometry using the MACSQuant® Analyzer. Cell debris and dead cells were excluded from the analysis based on scatter signals and propidium iodide fluorescence. A scientific poster presenting TIL isolation from syngeneic mouse tumors with CD45 (TIL) MicroBeads can be downloaded from the Related Resources panel to the right. CD4/CD8 (TIL) MicroBeads are optimized for the isolation of CD4+ and CD8+ TILs from single-cell suspensions of mouse tumors. For the specific isolation of individual CD4+ and CD8+ TIL subpopulations CD4 and CD8 (TIL) MicroBeads are available. Isolation of CD4+ and CD8+ TILs from a tumor induced by the B16-OVA cell line. The tumor was dissociated using the gentleMACS™ Octo Dissociator with Heaters in combination with the Tumor Dissociation Kit, mouse. CD4+ and CD8+ TILs were isolated from the single-cell suspension using CD4/8 (TIL) MicroBeads, two MS Columns, and a MiniMACS™ Separator. Cells were fluorescently stained with CD4-PE-Vio® 615 and CD8b-VioBlue® and analyzed by flow cytometry using the MACSQuant® Analyzer. Cell debris and dead cells were excluded from the analysis based on scatter signals and Viobility™ 405/520 Fixable Dye fluorescence. A scientific poster presenting the isolation of CD4+ and CD8+ TILs using MACS MicroBeads can be downloaded from the Related Resources panel to the right. The frequency of endothelial cells and pericytes in tumor tissue is usually below 4%. Therefore, pre-enrichment is necessary for most downstream assays. Depletion of CD45+ cells prior to endothelial cell enrichment with CD31 or CD146 (LSEC) MicroBeads allows specific detection based on markers such as CD31 and CD146. Flow cytometry is a suitable technique for the identification and quantification of the various lineages found in mouse tumor tissue. Expression of cell surface markers on tumor cells is highly dependent on the cells’ origin. Common epithelial markers are not available, making an analysis difficult. TILs on the other hand can be easily detected by their ubiquitous and specific expression of CD45. A multitude of TIL subpopulations can be defined by the expression of surface marker combinations. Fibroblasts express CD44, CD90.1 or CD90.2 (depending on the mouse strain), and vimentin. As these markers are also expressed by other lineages within the tumor, marker combinations are required for clear identification of fibroblasts. Endothelial cells can be detected based on the markers CD31 and CD146. However, specific detection requires marker combinations such as CD45–CD31+. Suitable flow cytometry antibodies for immunophenotyping of tumors or the characterization of T cells from the tumor microenvironment are listed below. Magnetic isolation of CD8+ T cells improves the quality of flow cytometry analysis. Total (A) or magnetically isolated CD8+ T cells (B) from B16-OVA tumors were labeled with the reagents described in the table above and analyzed by flow cytometry using the MACSQuant® Analyzer 10. Gated populations show viable cells. Magnetic isolation of CD8+ T cells improves the quality of flow cytometry analysis. 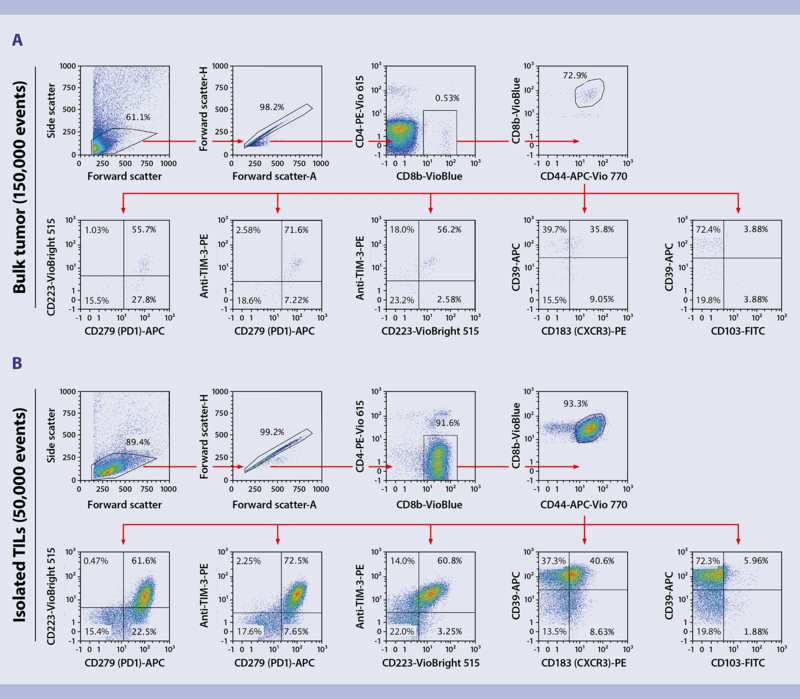 Total (A) or magnetically isolated CD8+ T cells (B) from B16-OVA tumors were labeled with the reagents described in the table above and analyzed by flow cytometry using the MACSQuant® Analyzer 10. Gated populations show viable cells. A list of MIltenyi Biotec cancer-related antibodies as well as a scientific poster describing a gating strategy for the analysis TILs can be downloaded from the Related Resources panel to the right. Additional details about Miltenyi Biotec antibodies and dyes for cell analysis can be found in the section MACS Flow Cytometry – antibodies.